Autumn is on the way. Many will head to the Blue Ridge and Alleghenies to bask in the colors of fall. While the trees are truly impressive, the prize for the most colorful part of nature this time of year must go to our only native trout, the brookie. A wild brook trout’s markings set it apart as a creature of many colors all year round, but in the fall, while spawning, a healthy brookie adds a brilliant crimson glow to its usual palette of greens, yellows, reds and blues. I still remember catching my first brook trout on the North Fork of the Moormons River. Holding it in mesmerized silence I thought that all the colors in the world were contained somewhere on its skin. My appreciation for this fascinating fish grew even more when I released it. I watched it disappear before my eyes, its outrageous coloring turned to perfect camouflage when returned to its watery home. 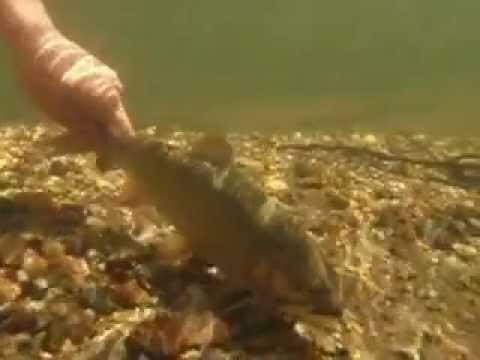 In the fall, brook trout find there way upstream where the females prepare a bed of gravel called a redd where the eggs will be deposited and fertilized. Males compete for access to the female and her redd. The fertilized eggs stick in the crevices of the redd as the female gently covers them by gently dislodging pebbles in the current upriver. The temperature of the water controls incubation time such that the fry will hatch in early spring when food for the young is available. Thus, eggs released in October or December, for example, can all hatch in March. Brook trout seldom live longer than five years and, in Virginia, a 12" brookie is worth mentioning. The beauty of the brook trout evokes the sacred nature of our earth, and its struggles underscore the planet's delicacy. In the tiny headwater streams of the James River watershed these fish live amongst the waterfalls, an improbable and challenging environment for survival. The brookie needs cold water with plenty of dissolved oxygen and a healthy population of aquatic insects on which to feed. Individual populations of the brook trout have long been at the mercy of drought and acidic deposition caused by air pollution. Today, global warming threatens the entire southern range of this species, including Virginia's fabled population of the well-loved fish. The James River Association's State of the James Report shows that brook trout are healthy in only 9 streams out of 100 in which they once thrived in our watershed alone. To restore and protect our brookies, forested watersheds must be protected while acidic deposition and global climate change are addressed. Keeping fossil fuel emissions out of the atmosphere by making personal choices to use energy more efficiently is one way we can directly support the brook trout. If you do fish for our native brook trout, please always handle them gently and release them. If fishing in the fall, leave spawning fish alone and watch your step while wading to avoid disturbing the spawning beds or gravel in shallow water.